A Great Gift Idea For Any Dog Lover! Here's a great idea for that hard to buy for dog lover. A fabulous gift pack containing all natural, pH balanced, and sulfate free grooming essentials from Fuzzyard for their best friend! 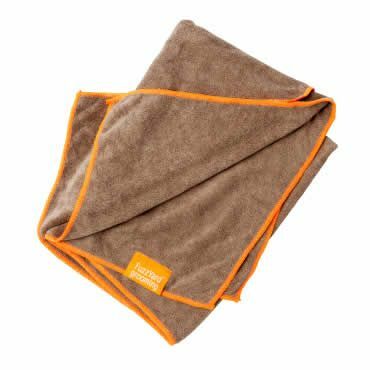 All packs include a 220ml Natural Dog Shampoo, 220ml Natural Dog Conditioner, and a Fuzzyard Microfiber Dog Towel. Moisturising - The Moisturising pack suits all types of dog coats to provide a gentle and refreshing wash. The Moisturising shampoo combines Basil and Eucalyptus for a naturally fresh scent and the conditioner calms and soothes with its blend of Lavender and Vitamin E.
Sensitive - Start with the Oatmeal-based shampoo, the natural properties of which may help to alleviate dry, itchy or irritated skin. Finish with the Sensitive conditioner containing a second dose of Oatmeal and soothing Aloe Vera to keep your four-legged friend happy. Super Shine - A lush combination of Tangerine and Rosemary Oils gives your dog’s coat an exceptional gloss while Wheat Protein revives and strengthens. Follow with the healthy Super Shine Conditioner with premium grade Cocoa Butter for an opulent finish.